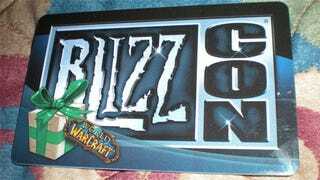 The folks at Blizzard don't beat around the bush when it comes to their swag. You show up to pick up your badge, and bam, big bag of swag, for you! Once I got back to my secret lair at the fashionable Super 8 Hotel, I did what many folks who have stayed in this hotel in the past have done before me - I spread it out and started taking pictures. Highlights of the bag include the inflatable Frostmourne sword, the Diablo III stress ball, Padaren Brewmaster beer cozy and bottle opener, and of course the card containing the codes for the polar bear mount and Starcraft II beta. My personal favorite? A small box of tissues labeled "QQ nOOb." Awwwwwww.